All participants of the competition who fulfill the conditions of competition sponsor, can pick up well-deserved REWARD - HD textures for ONE scenery by own choice from www.condorworld.eu and digital diploma for participation. Thanks goes to all pilots for joining us here in the sky over Brno and special thanks to Radek (RM) for hosting servers and tasksetting. Big thanks goes to Miloš "Cadfael" Koch (MK) for preparing for us such a great sceneries as SlovakiaCE and for his sponsor gift - HD textures. And here we have another virtual soaring contest. This time we will fly from/to Medlánky and Brno. Town where live a really cool man - Miloš "Cadfael" Koch - author of many beautiful sceneries for Condor. This competition as an expression of our gratitude and appreciation of his work for us will have in title a name of Miloš "company" for sceneries - CondorWorld. Back to contest: it's small competition with seven racing days, Club Class with IGC index used, Racing tasks and AAT/S from 150 to 300 km, scenery SlovakiaCE 6.0. 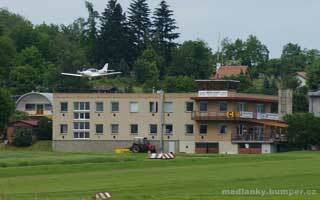 Competition home airport - Medlánky - nice photogallery of real Medlánky airport we have from Bumper. We offer you also his Virtual Medlánky skins for download. More informations about this competition - as usual - in rules. This competition is continued line of successful competitions like Liptov Shepherd GP, Praděd GP Gliding, Raven Competition, Kiwi Race and OCC. Please - give your attention to rules! Will be need registration, server password will be published in briefing. After each race you must send IGC file.